Norwich City played Tottenham Hotspur on Wednesday evening at Carrow Road and they were hoping to get their season back on track following a humiliating defeat to non-league Luton Town. Nine changes were made to the team that lost to Luton, including the return of influential captain, Grant Holt, and solid centre back Sebastien Bassong. Norwich started the game well, pressing Tottenham back deep into their own half and this pressure paid off with Wes Hoolahan bagging the opening goal. A cross came in from Snodgrass on the right; it was met at the back post by Holt, who nodded it down for Hoolahan to slot in past Hugo Lloris. The first half was dominated by Norwich, but the second half was a different story as Tottenham controlled the play and looked dangerous. Norwich stood firm for the majority of the second half onslaught until a counter attack in the 80th minute. Welsh international Gareth Bale picked up the ball on the halfway line and ran past a few City players before unleashing a world class strike into the bottom left corner. 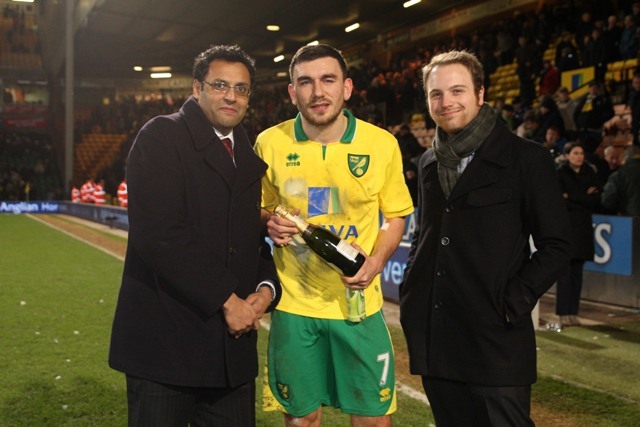 The game ended 1-1 with Robert Snodgrass being named the Anglian Home Improvements Man of the Match. Transfer deadline day has now been and gone and everyone from Anglian welcomes Kei Kamara and Luciano Becchio to the club and wish them the best of luck for the rest of the season.